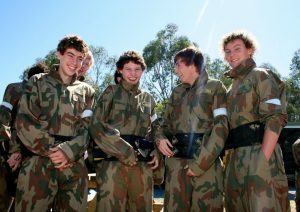 Although the battle continues to have legislators reduce the minimum age to participate in paintball around Australia,months of work have finally paid off with both Victoria and the ACT approving the new modified version of Paintball called MiniBall for players under the age of 18. Using a modified gun classified as a toy, spring pressure alone propels a 0.50 calibre MiniBall out of a bright red gun toward the target. 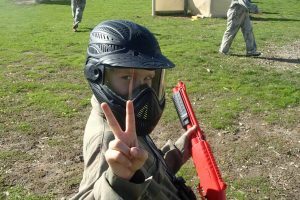 All players are protected with the full complement of safety gear that is afforded to Paintball players including body armour, full head helmet, padded collars and camouflage overalls. Superintendent Russell Barrett from Victoria Police’s licensing and regulations division told the Canberra Times; police have a “good working relationship” with the industry and Delta Force Paintball wasn’t acting illegally. He said police weren’t aware of any moves to lower the age restrictions for paintballing. AUPBA President, Leon Bubenicek said that he would be contacting the Victorian Police’s Licensing and Regulation Division to update them on the initiative to lower the Paintball minimum age and is looking forward to “open and meaningful debate” on the topic. Over 1000 players have already enjoyed the MiniBall experience in Victoria and the ACT since the first games early this month and the feedback has been excellent. For any information on the MiniBall variation of Paintball or on the Minimum Age initiative, please contact the Australasian Paintball Association.